Ask any parent which time of day they find the most stressful and I bet mealtimes are way up there. Trying to persuade a child that they need to eat the meal you have lovingly prepared for them can feel utterly impossible at times. No amount of cajoling, tempting, or bribery will get a single morsel past their lips. 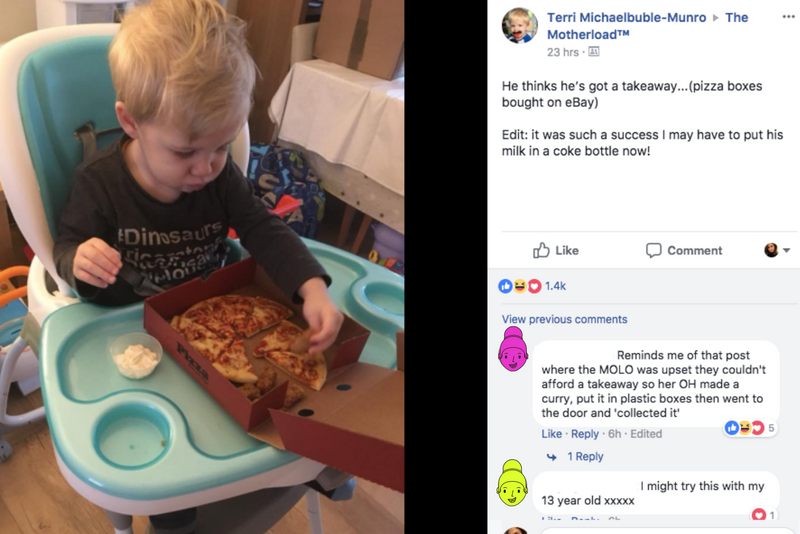 If this sounds familiar, why not try the Toddler Takeaway trick? It was such a success I may have to put his milk in a coke bottle now! Katherine said: Genius! I’m going to try similar with the plastic tubs from the Chinese takeaway! Harrobed went even further: Why have I never thought of this before?! You deserve a gold star!! Jenna commented: Surely this post has won the internet today? Gabrielle wondered: Think it works on 14 year olds??? Like this? Share it and save the sanity of another parent who is going crackers because their child won’t eat! UPDATE: The Toddler Takeaway has really taken off! It’s now been covered by The Mirror, Huffpost UK, Mailonline, The Sun, the Birmingham Mail and the Liverpool Echo – great work Terri making teatimes all over the UK a bit less stressful! For more amazing MOLO parenting hacks, read about The Ten Dummy Trick and The Hug Button. And for the latest, head to ourhomepage.